Shown here is a view of the loving cup. 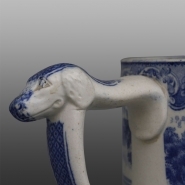 Shown here is a view of the loving cup's molded dog-head handle. 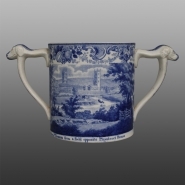 A two-handled loving cup printed with two different scenes of Taunton, Somerset. The views are: A view of Taunton from a field opposite Playstreet House and View of the Tower of St. Mary Magdalens Church, Taunton.